What can I say, 102 degrees behind the greenhouse in the shade, 99 degrees on the porch, deep in the woods. We are pumping lots of water to try and keep everything happy. So far it seems to be working. We are having some trouble with the tomatoes, especially the large ones like the Striped Germans and Kellogg’s Breakfast. When ever it is this hot it seems they can’t get enough water and will have hollow areas inside them just beneath the outer layer. It actually has an official name “Puffy Wall”. Supposedly caused by a combination of high or low temperatures way back at pollination and a nitrogen:potassium ratio that is out of whack. All I know is we see it when its extremely hot, it is almost like the tomatoes start to dehydrate from the inside. They still taste fine but sometimes are not the perfect slicing tomato for the plate. This has been a week or so of turkey high jinks. This morning topped it off. Last night they did not go into their shelters at dark like they always do, so when I went out to close them up they were all down in one corner of the field sleeping in the grass. I figured it was the heat and just let them stay out for the night. This morning when Betsy went out at 5:30 for her walk she came back in immediately and rousted me out because forty odd birds were outside the fence and wandering all over the farm! With not too much herding we got them all back inside the fence, eating and drinking like it was all normal. This was after a long week or two of “turkey issues”, that started with the big guys picking on one of their own so badly that we had to put the injured bird in the Turkey Hospital. After a week the bird, now know as Buckwheat, was all healed up and eager to get back with his pals so I carried it down and put it in with the others. Immediately they started after him again so I took him back to the hospital. The next night I slipped him in the shelter with the others thinking that they would wake up the next morning not notice another bird amongst the crowd (turkeys seem to have no short term memory). All went well and when I let them out the next morning they started back in on him. Puzzled I took him out again and set him up in his own outdoor area, under the figs, as he couldn’t continue to stay in the 4′ X 4′ hospital room. Maybe when I moved the rest of the group in a day or two they would be so distracted by new turf that I could put him in then and no one would notice. He was so lonely that he would just sit there and call to his buddies. At one point he even flew out and ran down to the others pacing up and down the fence wanting to get in, but the bullies were trying to get at him through the fence! So we put him back under the figs and grabbed one of the others and put it in with him so he would have company. That bird just sat and called to his friends and eventually flew out and went back to the others. Nothing was working. 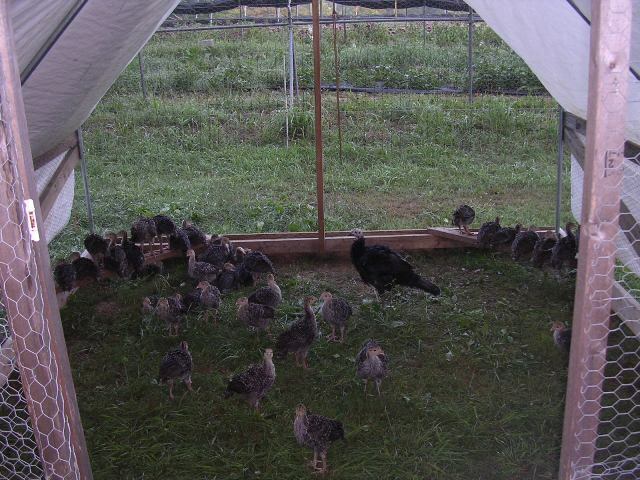 As the “little boys” were now three weeks old and ready to start going outside we decided to put Buckwheat in with them until they graduated out to the field in a few weeks. When everyone gets integrated after awhile all will be back to normal. Kind of a Trojan horse trick. So off we went with Buckwheat under armand put him in with the little guys. Love at first sight! He was walking around like the big man on campus and they were all huddled around his legs. Now almost a week later it is Buckwheat and his posse!